CubeSat X-ray telescope (CubeX), developed under the NASA Planetary Science Deep Space SmallSat Studies (PSDS3) Program, is a concept for a 6U planetary X-ray telescope (~40U with spacecraft) designed to map the surface elemental composition of diverse airless bodies by spectral measurement of X-ray Fluorescence (XRF) excited solar X-rays. 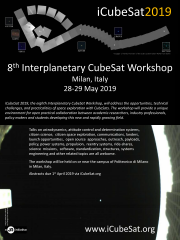 CubeX will also demonstrate millisecond X-ray pulsar timing based deep space navigation (XNAV). Successful XNAV will enable autonomous deep navigation with little or no support from the Deep Space Network, hence lowering the operation cost for many more planetary missions. The first CubeX concept, described here, is designed to study the Moon as a secondary spacecraft (S/C) on a primary lunar mission during the next solar maximum (2023-2027). The primary science objective of CubeX is to identify and measure compositions of lunar lower crust and upper mantle outcrops excavated by impact craters, which are key missing ingredients in understanding the early stages of the formation and evolution of the Moon. CubeX carries two X-ray instruments: an X-ray Imaging Spectrometer (XIS) and a Solar X-ray Monitor (SXM). The XIS conducts both XRF observations and XNAV operations, while SXM monitors solar X-ray activity during lunar XRF observations. The SXM is required to properly infer elemental abundances from XRF measurements since the XRF flux and spectra depend on the incident solar X-rays on the lunar surface. CubeX S/C, which is about 43 kg in total mass and 35 x 23 x 60 cm in size, fits well in fairing of common launchers for lunar missions. After insertion into a common elliptical lunar orbit (500 x 5000 km), CubeX transfers to a science-optimized quasi-frozen circular polar orbit at 6000 km for the 1-year science operation. The chosen science orbit at high altitude requires relatively low maintenance, and the long period of the science orbit is ideal for both XRF observations and XNAV operations.